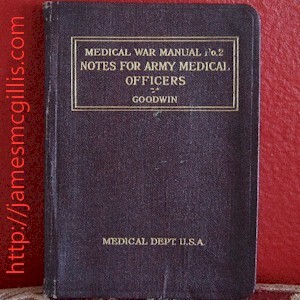 Description: First Edition of the 1917, �Medical War Manual No. 2�, subtitled, �Notes for Army Medical Officers�, �Medical Dept. U.S.A.� By Lt.-Col. T.H. Goodwin, R.A.M.C. Barns & Noble says, �Many of the earliest books, particularly those dating back to the 1900s and before, are now extremely scarce.� Some rubbing and bumping of spine, with added typed note inside, �This book to be circulated to the officers named below� at �Base Hospital #30� (later the UCSF Medical Center, San Francisco, California).